This rabbit website is designed to give you proper, well researched information, help, knowledge and interesting articles that come from many years working experience. We continually add to the site and ask that you pay regular visits, when you need help or information. You can go to our forum, where you can start a discussion, ask questions, give helpful tips, make comments and add up to 4 photos. There are other discussion forums on our 'Rabbit breeds' and 'care' pages, if you have questions or concerns about your pets breed or health and care. 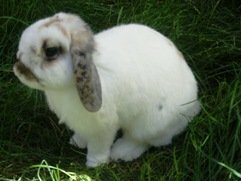 Or why not design your very own web page, on this site, all about your rabbit, complete with photographs. To do this, go to the 'Rabbit breeds' page and complete the form at the bottom. You can upload up to 4 photos and even have a separate page for each pet. Our intention is to make this site a 'one stop all', for any information or help you need, so please do bookmark our site. To fully enjoy their company, there are many concerns such as the correct feed and bedding, how to groom or train, how to understand their body language, what certain health problems may indicate, along with many other matters. They like to live with each other, in pairs or they can make charming companions to their owners. Being intelligent and sociable creatures, you will find each one carries its own different personality and particular way of communicating. They love to be groomed, stroked and petted, not just by each other, but also by an affectionate human companion. Whether kept in the house or the garden, they are the third most popular pet. Yet, experience shows, there is a shortage of good information concerning proper care, or what certain aliments or illness may mean. Sometimes information you find can be very conflicting and more importantly, misleading. Visits to vets, who are experienced and knowledgeable with cats and dogs, can result in a less informed approach, when it comes to your pet. This site has articles ranging from care, feeding, foods that harm, training, health concerns, vaccinations through to neutering and spaying, types and breeds, predators, suitable hutches or runs, or build your own hutch, and more. There is a section dedicated solely to caring for the very young or babies, what to feed for those first weeks, when neutering or spaying should be considered and when to have them vaccinated for diseases such as myxomatosis and viral hemorrhagic. Write about their mannerisms, where you got them, age, any tips you can give, if kept indoors, how do you keep and care for them? Other visitors can view the page for ideas or maybe offer a helpful suggestion. Whether yours is kept outside in the garden or house trained (or a bit of both), a dwarf or giant, alone or with others, whether you have a health concern or you just want to discover new ways to care or even entertain your pet, this site aims to help and answer your concerns.